강릉농악은 강원도 태백산맥 동쪽에 전승되어 오는 대표적인 영동농악의 하나로 농경생활을 흉내내어 재현하는 농사풀이가 있기 때문에 농사풀이농악이라고도 한다. 유래에 관한 정확한 기록은 없으나 농경생활을 시작하면서부터 발생한 것으로 추측된다. 강릉농악은 농기, 쇄납(날라리), 꽹과리, 징, 북, 장구, 소고, 법고(불교의식 때 쓰는 작은북) 및 무동(사내아이)으로 편성된다. 연주자들은 흰 바지저고리에 홍·청·황의 삼색띠를 두르고 무동들은 여러 가지 색깔이 섞인 옷을 입는다. 강릉농악에는 정월 대보름을 전후해서 3∼4일간 농악대가 집집마다 다니면서 농악과 고사를 나는 지신밟기, 마을의 공동 기금을 걷기 위해 걸립패로 꾸며 농악을 하는 걸립농악, 모심기와 김매기 등을 할 때 하는 김매기농악, 김매기가 끝난 후 질 먹을 때 하는 질먹기, 건립굿이나 봄철 화전놀이 때 큰 마당에서 벌이는 마당굿이 있다. 타지역에 없는 달맞이굿(달을 보고 소원을 비는 것), 횃불놀이, 놋다리밟기(젊은 여자들이 1명을 뽑아 자신들의 허리 위로 걸어가게 하는 놀이)가 있고, 두레농악이라 할 수 있는 김매기농악과 질먹기, 길놀이농악이 있는 것이 특색이다. 강릉농악은 단체적인 놀이를 위주로 하여 농사의 고달픔을 잊고 서로의 화합과 마을의 단합을 도모하는 중요한 역할을 담당하고 있다. 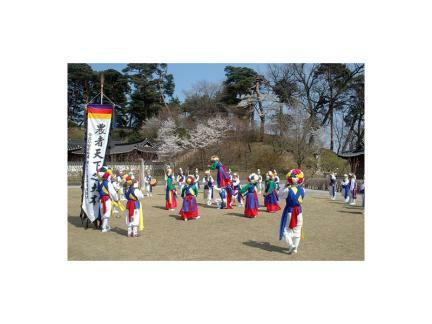 Gangneung Nongak is a leading farmers’ music handed down in areas east of Taebaek Mountain Range in Gangwon-do. Also called nongsa puri (explanation of the farming process) music, the music is presumed to have been naturally made with the start of farming. 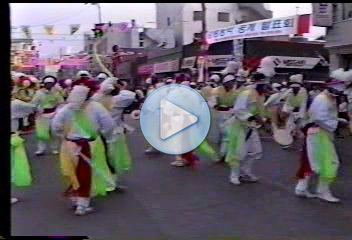 A Gangneung Nongak troupe is composed of people carrying farming tools, swaenap (conical wooden oboe), kkwaenggwari (small gongs), jing (large gongs), buk (drums), janggo (hourglass-shaped drum), sogo (small drums), and beopgo (Buddhist drum), and mudong (dancing boys). Performers wear white jacket and trousers, with their bodies decorated with bands in three colors (red, blue, and yellow); dancing boys wear colorful clothes. 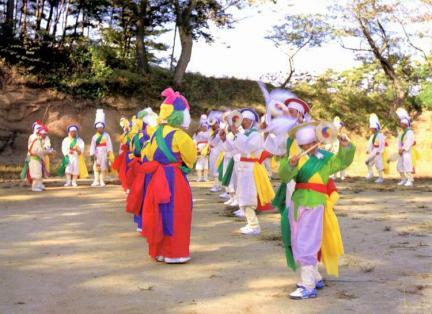 Gangneung Nongak is performed on the following occasions: jisin bapgi (“earth spirit treading”); geollip nongak [geollippae (fund-raising troupe)’s performance]; gimmaegi nongak (performance for planting rice seedlings and weeding); jilmeokgi (party for farm laborers); geollipgut (geollippae’s shamanic performance); madanggut (courtyard ritual), etc. 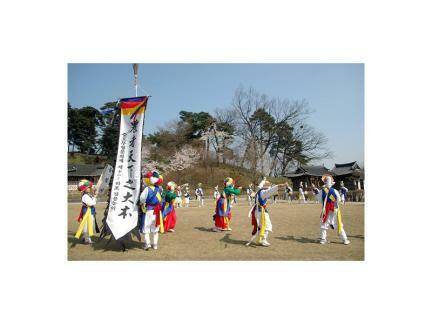 The foregoing events are also held in other regions, but the following are performed only in Gangneung with the accompaniment of Gangneung Nongak: dalmajigut (rite to the first full-moon), hwaetbul nori (torch play), notdari bapgi (one selected among a group of young women, who treads on their waists as they lie down), gimmaegi nongak, jilmeolki, and gil nori nongak (road performance). 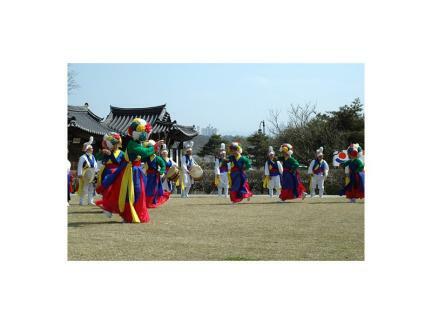 Gangneung Nongak plays an important role as an event that provides consolation in the hard life of farmers and helps villagers build friendship with each other.